A Montessori was a leading thinker in education whose ideas were, in many ways, ahead of their time. She was born in Chiaravalle, Italy, in 1870 and became one of that country’s first female physicians in 1886. She observed and studied the learning process of children and concluded that children teach themselves based on what they find in their environment. She developed educational philosophy, materials and methods based on her scientific observations of young children’s behavior. Her philosophy, methods, and materials eventually became known as the Montessori approach. Dr. Montessori observed that the best learning occurs in multi-age classrooms and home-like settings where children at various stages of development learn from and with each other. Her ‘developmentally appropriate’ materials were designed to fit each child instead of making ‘each child fit the program.’ These materials provide experiences contributing to the growth of self-motivated and self-regulated independent learners. Dr. Maria Montessori felt that the goal of early childhood education should not be to fill the child with facts from a pre-selected course of studies, but rather to cultivate his/her own natural desire to learn. 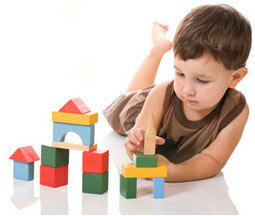 Dr. Montessori wrote, "The most important period of life is not the age of university studies but the first one, the period from birth to the age of six.” Research has established the critical importance of first 6 years of life for the child’s physical, emotional, social and cognitive development. There is a very rapid growth of intelligence in early years than at any later period of life. This is the time when there is the greatest need of a well-prepared nurturing environment and a well-trained knowledgeable adult. Any obstacle encountered by a child during the process of growth will impede his creativity and will lessen the chances of achieving perfection. In a Montessori environment, the materials are always chosen and selected according to the developmental level of the children and their readiness to grasp the concepts. Dr. Montessori was uniquely creative in this area. She believed that the setting in which learningtakes place is equally as important as the child and the directress (teacher). In a Montessori classroom, there is a sense of structure and order. Materials are placed in order from simple to complex and from concrete to abstract, enabling the children to internalize the challenging concepts easily. Order in the environment helps the child do things without needing an adult’s assistance. Everything has a permanent place. Children move about as they select their work from the shelves; they work with the materials and then they return the materials to the shelves. ​There is a quiet, yet a busy atmosphere. Children choose their own activities and are totally involved, engaged and interested in what they are doing. The environment promotes responsibility, independence and self- discipline. "The things he sees are not just remembered; they form a part of his soul." Dr. Montessori believed that each child is different and possesses different potentials.She realized that children being different from each other need the freedom for their individuality to grow. This individuality should be respected and safeguarded.Dr. Montessori observed that each child during his course of development passes through certain periods, which she named “Sensitive Periods” when he/she focused towards certain elements of environment to the exclusion of others. Therefore, every child in the environment should be provided appropriate materials to help him acquire certain characteristics thus fulfilling his need of development. The directress plays a significant role in the environment by providing appropriate challenges when the child is ready, so that he/she meets success. The Montessori materials are didactic materials as they help children to learn through repetition and self-correction. These materials develop visual and tactile discrimination and differences in dimensions. These materials are indirect preparation for more advance skills and concepts in language, math and science. Young children possess unusual sensitivity and mental powers for observing, absorbing and learning from the environment. They have a deep love and need for constructing themselves. These Montessori materials in a prepared environment allow children the freedom, which guarantees exposure to activities through which they accomplish the most important task – the development of themselves. Dr. Montessori believed that the education is not something which the teacher does, but that it is a natural process which develops spontaneously in the human being. The teacher’s task is not to talk, but to prepare and arrange a series of motives for cultural activity in a special environment made for the child. In Montessori classrooms, teachers address the needs of individual children who are learning through practice, repetition, and self-correction with hands-on materials. Dr. Montessori believed that the directress (Montessori teacher) is the vital link between the child and the prepared environment. She named her “Directress,” as her job is to direct child’s physical, mental, emotional and spiritual energies into constructive channels. She directs the child’s activity to suit his/her inner needs. She is a perceiver of the child’s needs, the preparer of the environment and a programmer with materials and lessons. The Directress must have the art of observation in order to fulfill the child’s inner urges by providing appropriate materials and guiding energies in right direction. She must be prepared internally (spiritually) and externally (methodologically) to keep alive the child’s enthusiasm for learning. The Directress needs to be flexible and have an open-mind. She should have an eye of a scientist to observe children, and the patience of a saint.